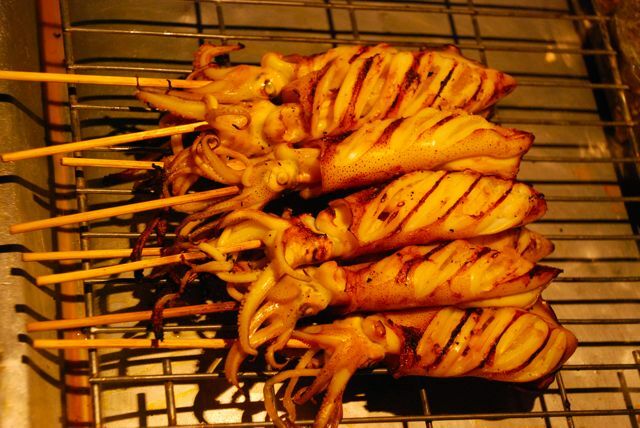 I’m a sucker for almost anything grilled, so walking down the street in Thailand can be a pleasantly laborious process. In certain areas it’s impossible to move more than a few feet without encountering a vendor grilling some type of delicacy. And if it’s not being grilled, it’s being fried, and I have no problems with that. 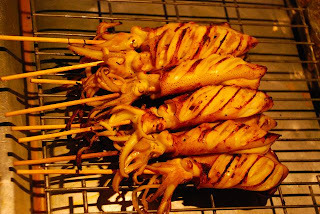 Identifying the object of the grilling or frying can, however, be problematic. The first pork wonton I blithely bit into turned out to be, well, not pork. It might have been a batter-coated egg of some sort. At least that’s what it felt like. Sort of. I’m still not sure what it was and I’m not sure I really want to know. That was on my first trip to Thailand. Now, having made the effort to master the language, I can confidently point to an enticing item, ask, “Ni arai?” (what’s this? ), and then try to maintain my air of nonchalant self-assurance as the answer inevitably eludes my rather limited Thai vocabulary. But it’s still enjoyable to pass an extra few minutes trying to communicate with a patiently smiling vendor. 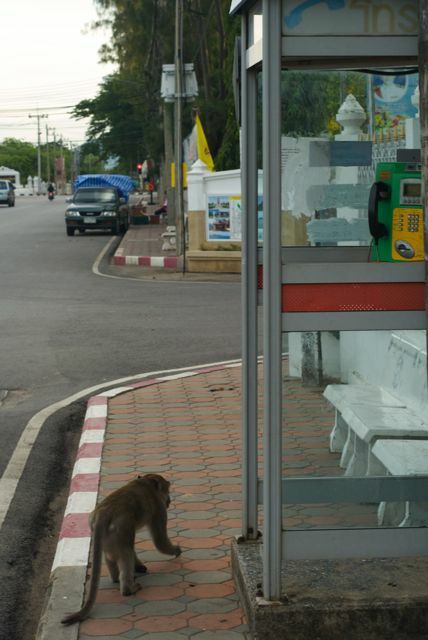 Occasionally my transactions turn into spectator sport, as happened when I was “rescued” by an English-speaking Thai passerby in a small town where I was one of only four foreigners (I counted). Seeing my attempts to purchase a snack, he crossed the street to helpfully identify the vendor’s offering as grilled bananas and translate the transaction. Lest you think I’m a complete idiot, I was perfectly capable of making that last diagnosis, especially having already reconnoitered the food stand to confirm that it featured my favorite snack. I didn’t need the intervention of the gustatory good Samaritan. However, his participation helped transform a simple purchase into an entertaining event shared by the small crowd of appreciative fans of foreign diplomacy who observed our conversation. I left with a bag of delicious bananas and that ineffable high that comes from a normally mundane experience unexpectedly transforming into something memorable. And now Google and other nefarious purveyors of communication technology want to take that away. The other day I caught the tail end of a radio news story about a phone application that translates a user’s spoken words in one language into another language that is then “spoken” aloud by the phone. The radio commentator enthused about the communication possibilities of this Google app for Android phones and the author of the linked article calls it “crucial” for travelers, but that seems a tad extreme. Ok, I’ll admit it’s a cool, useful application that will probably be invaluable in some venues and situations. I just don’t think regular travel (as opposed to, say, doing medical work in a remote area) is one of them. The device reminds me of the babel fish, the ultimate translating device for intergalactic travelers featured in the late Douglas Adams’s satirical and whimsical Hitchhiker’s Guide to the Galaxy series. Simply place this (thankfully) small fish in your ear and you’re able to understand whatever language is being spoken to you. Sounds great (aside from the ear invasion aspect), but I think that sometimes I’m better off not being able to communicate clearly with others. I’m not even referring to all the banality we avoid when we don’t share a common language with those around us. I’m thinking about all the experiences I’d miss out on if I used the translation device. was wandering around a Chinese city searching for a condom, as documented in his book Last Chance to See. (Nothing prurient to the story – the condom was needed to waterproof a microphone so his BBC crew could troll for river sounds. Of course.) Deprived of the benefit of having a short but dull phone app-assisted conversation with a store clerk, he and his crew struggled to get their meaning across to an ever-growing group of stall workers, finally resorting to sketching and then pantomime to get their point across. A store clerk eventually offered them a packet of birth control pills, presumably because the pills were a superior form of protection. Adams and crew emerged with their auditory prophylactic in hand, but also with a terrific experience, not to mention story, they never would have enjoyed had they been equipped with a bilingual phone. I’ll take the story over the condom any day. Well, almost any day. The inherent travel paradox is that not knowing a language can help you communicate with the locals who speak as little of your language as you do of theirs. By not relying on a mechanical translator, a person is forced to rely on her wits, perhaps learn a few words in a foreign language or explain a few words of her own, pay attention to and interpret facial expressions and body language, and maybe even extend the bond of trust to a stranger she cannot quite understand. In short, a traveler is forced to pay closer attention to his surroundings and make connections, however brief, with others. These sorts of interactions are bound to result in worthwhile and memorable experiences. Chances are that I’ll eventually own one of the translation programs; I just hope I never actually need to rely on it.